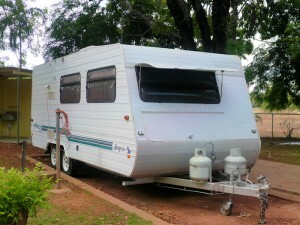 Have just returned late last night from relocating a second hand Jayco caravan from Sydney to Katherine in Northern Territory! A young family had purchased the caravan on Gum Tree & after finding me on Google Search they contacted CRS to quote on relocating their caravan north, but using my vehicle. They were happy & accepted my quote, so with a total kms of 7833 kms driving was in front of me so I set off on Friday the 8th November! It was an awesome 12 day experience driving through the Outback of Australia. Dodging dead & alive kangaroos, emus, sheep, goats, cows, dead smashed wild pigs laying on the highway, plus some strange looking large birds right across north western Queensland & into the Northern Territory!! Also the largest Road Trains I have ever seen west of Mt Isa, with overall lengths of 53 metres – MASSIVE HUGE RIGS who demand more than their share of the bitumen!! Delivered the caravan on Friday 15th, & after giving the van a wash down, clean plus hand over, I spent a night relaxing in readiness of the return 3200 odd kms drive home. Was taken out by the happy customers that Friday night for a meal as appreciation for a job well done & safe delivery. This was very much appreciated and a nice touch indeed. The two gorgeous daughters and young boy were an awesome friendly family unit with such wonderful manners. I started the homeward journey early Saturday morning 16th, coming south via, Dunmarra, Matarankra, Renner Springs, 3 Ways Roadhouse, Barkly Roadhouse, Cammoweal, Mt Isa, Cloncurry, Kynuna, Winton, Longreach, Emerald & then south down via the Burnett Highway with Biloela, Monto & onto the Bruce Highway via Gympie. The road kill on this journey north of Longreach was mind blowing to say the least. Even many of the locals I spoke to commented on how much road kill was laying on the highways lately. Bear Grylls from Man vs Wild show, would never go hungry along this route with choices like road kill kangaroo soup, road kill pork belly, road kill emu stew, what more could he wish for? The Toyota Land Cruiser went like a dream, my first outback lengthy journey with this baby and now I know why they call these vehicles “King of the Road”!! Outstanding & very comfortable with plenty of V8 diesel power! 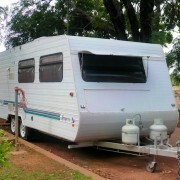 I look forward to the next adventure and relocation somewhere across Australia. Great to be home again. Thanks for reading my page and post!! Cheers for now, Anthony – my friends call me TT! !